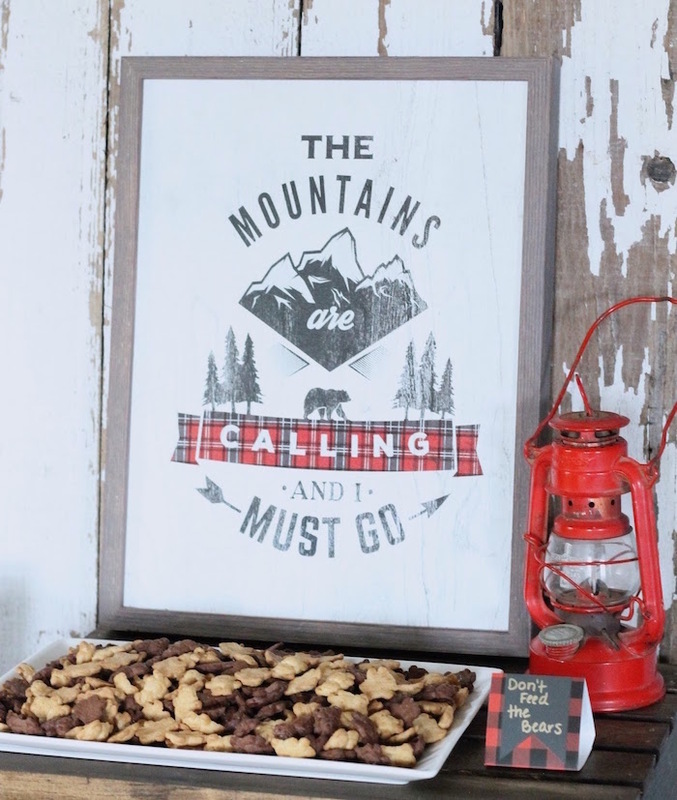 “TIMMM-BERRR”….Hiking for rustic party ideas? 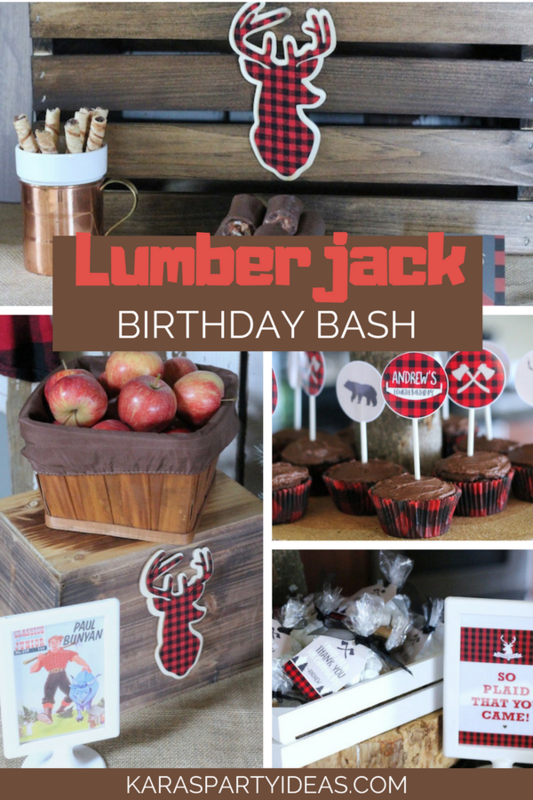 This Lumberjack Birthday Bash, is sure to make your day! 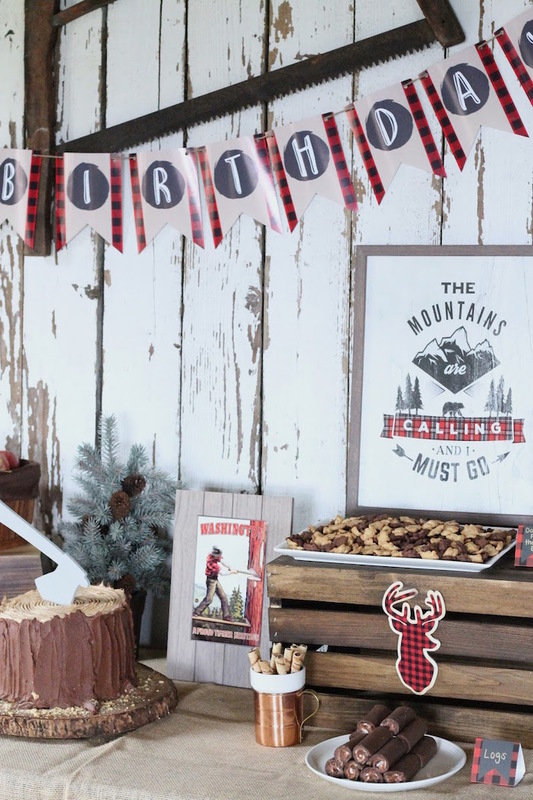 Styled by Toni Kruckeberg of AK Party Studio, out of Seattle, WA; this darling celebration is packed with cute party elements you’ll certainly want to saw away at! 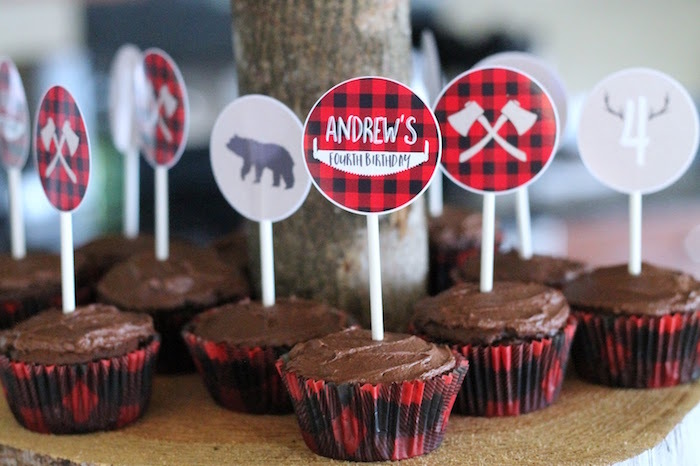 And Lumberjack Themed Sweets & Eats! 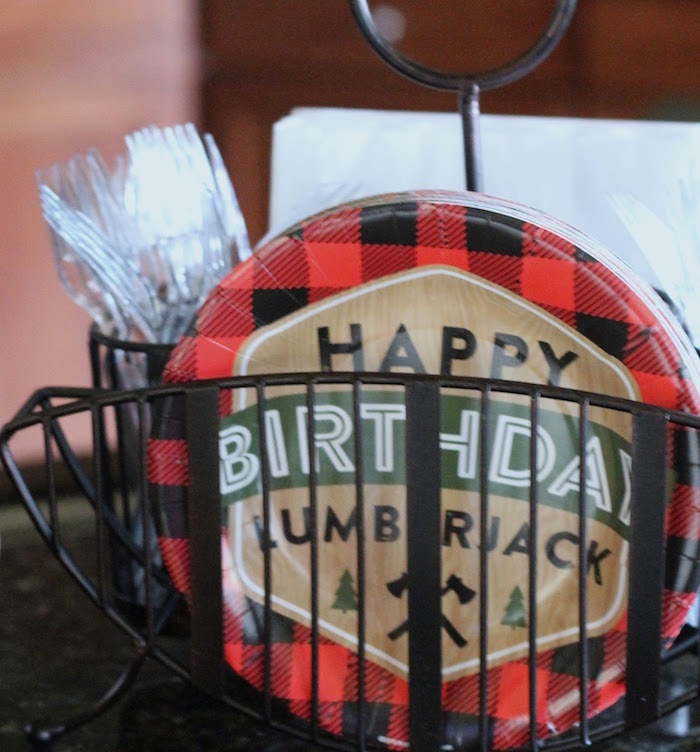 “We celebrated the big 4 with a party fit for a strong Lumberjack! 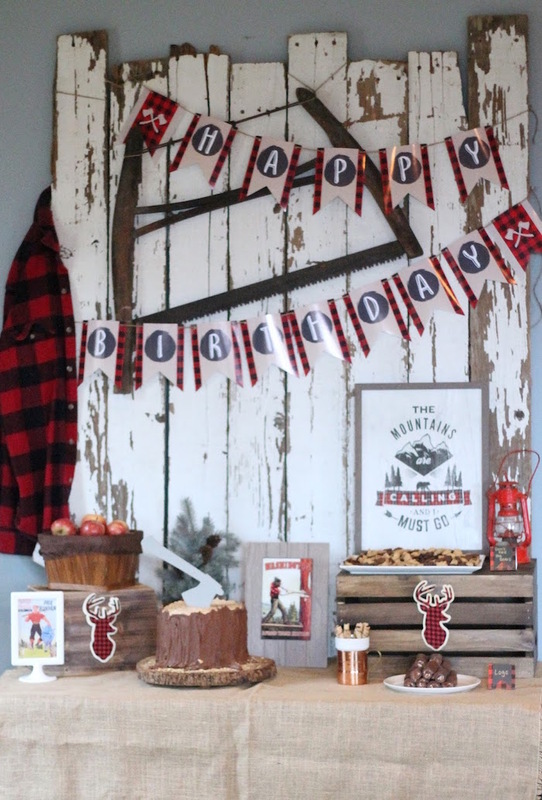 I think I enjoy doing these little boy parties because it gives me the opportunity to involve my husband and usually raid either his closet, garage or tools. 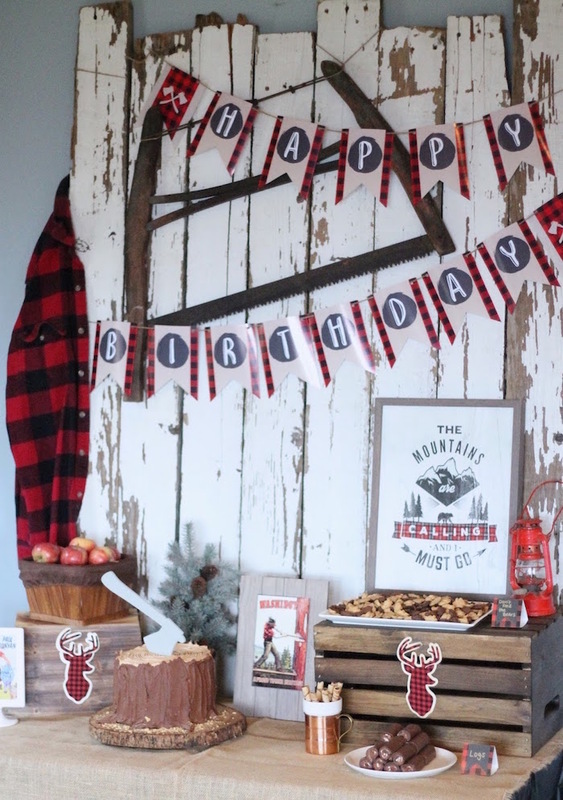 This party was no exception, I used his red flannel for the infamous lumberjack shirt that hung from some odd boards that made the snack table backdrop. 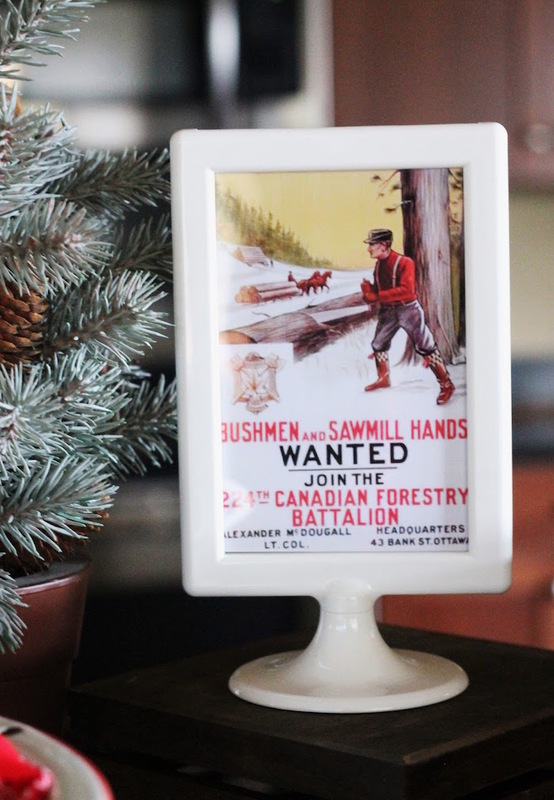 I used an antique saw and hung that from the boards as well. 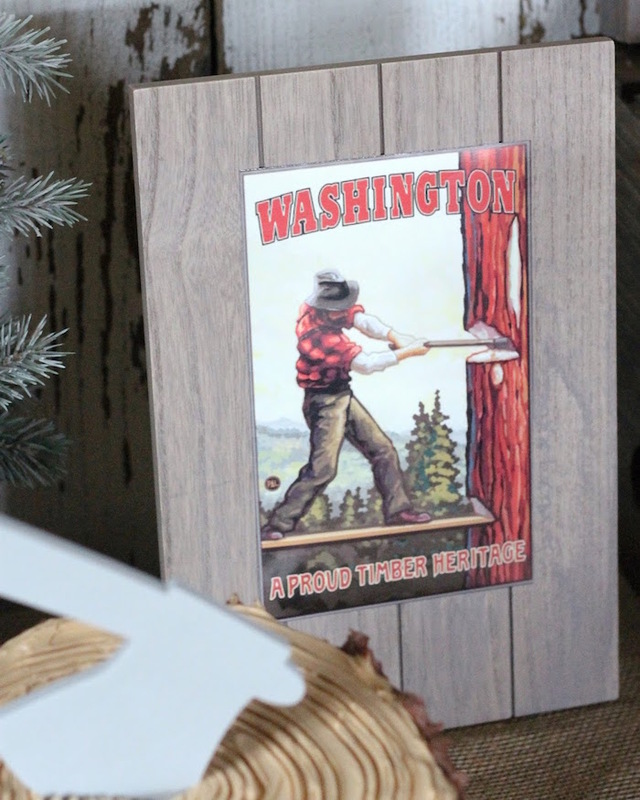 I found several vintage inspired prints from google, by searching “vintage Paul Bunyan”. 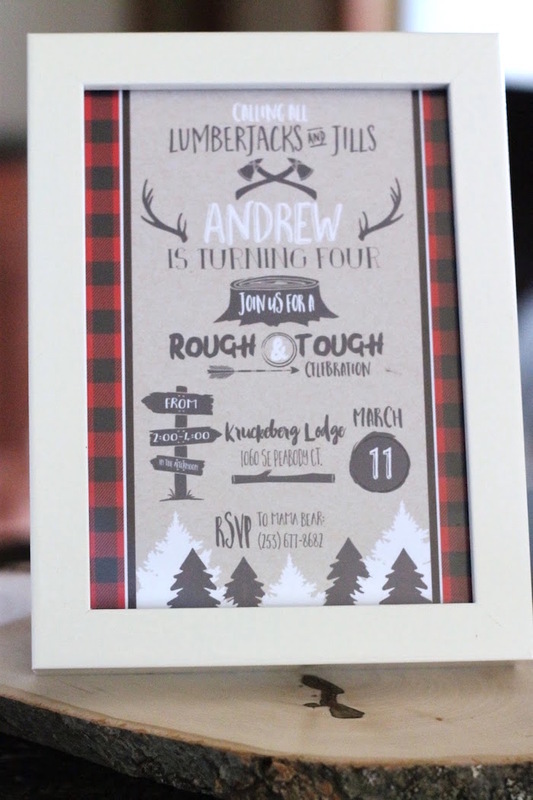 Print the images and then frame for additional party decor. 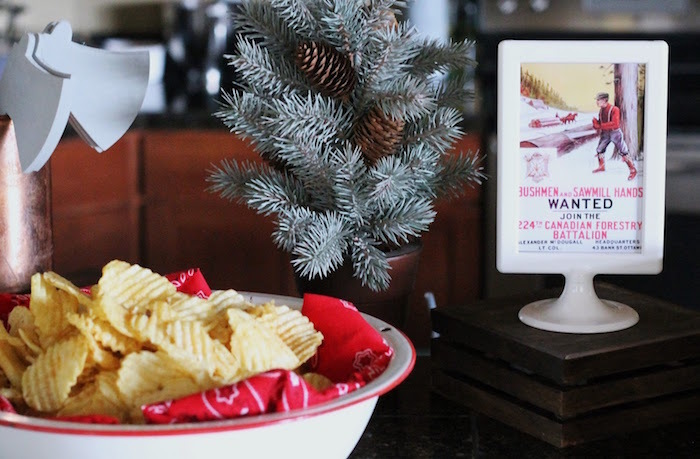 Having the party at a later time in the afternoon allows for serving only light snacks and dessert, these will definitely keep your costs lower. 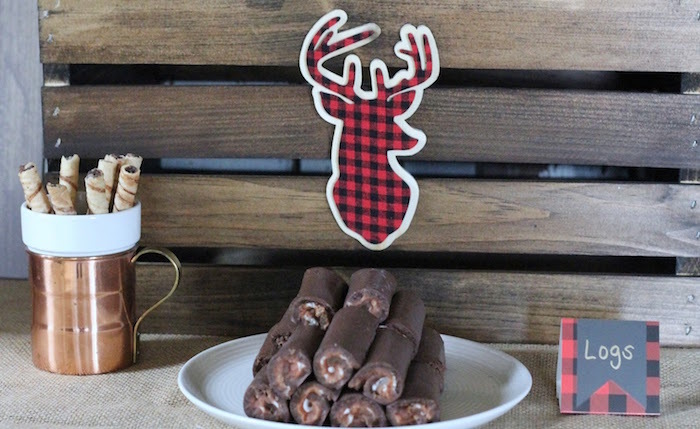 I also decided to make my own cake. 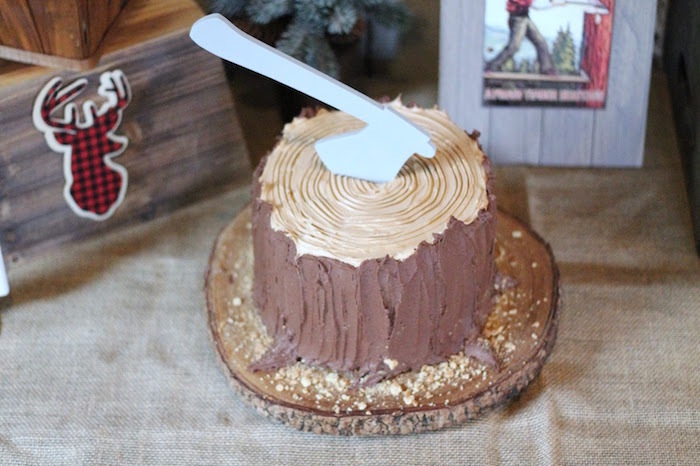 I had an idea for this stump cake after seeing quite a few ideas online. 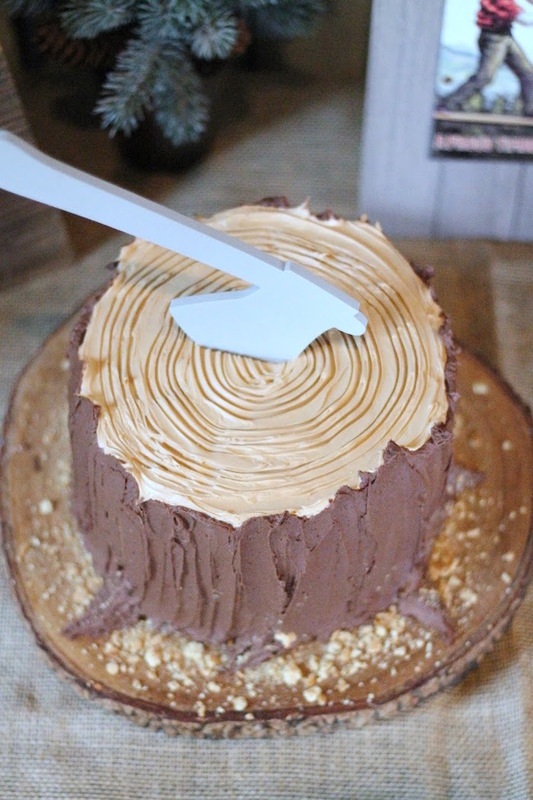 For more details on how I made the tree stump cake, check out my blog. 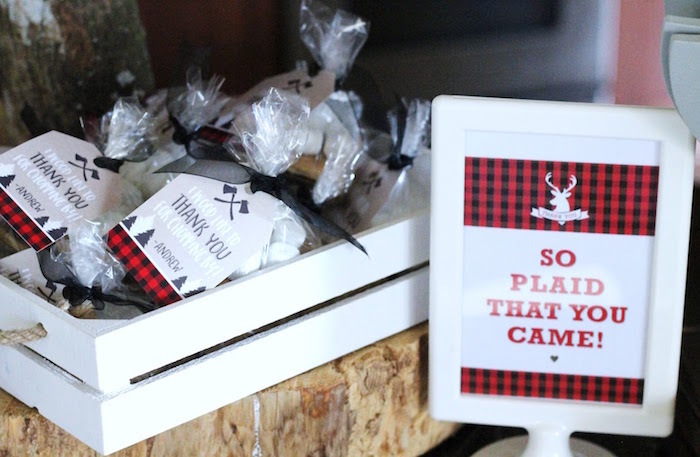 A key element to bringing your theme to life are party printables. 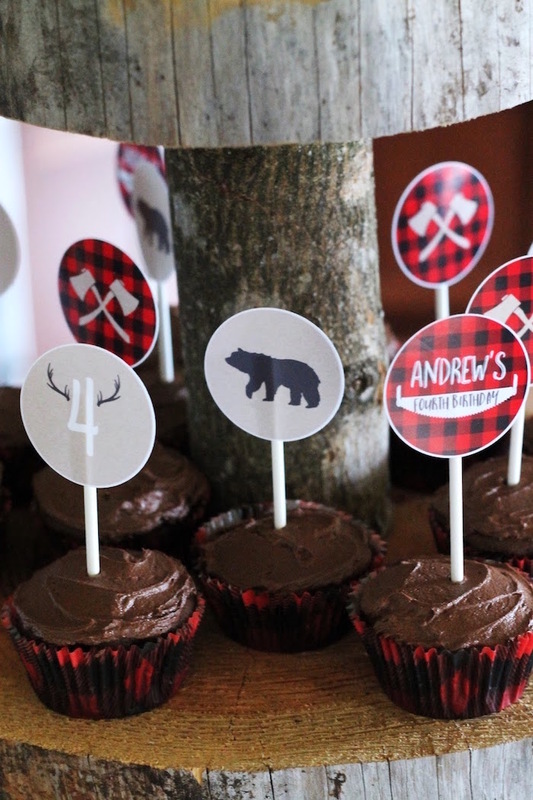 That could be the invitation, cupcake toppers, bottle wrappers, banners, you name it. 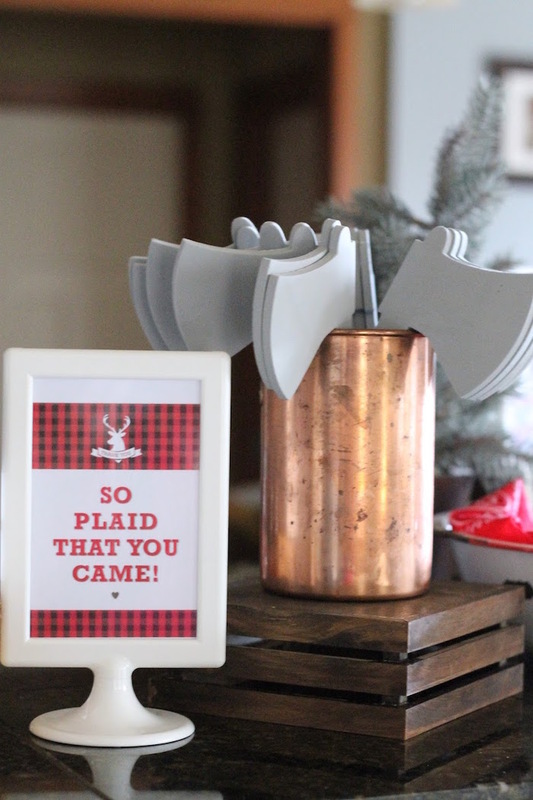 I ordered this darling lumberjack themed set from Just a Little Sparkle. 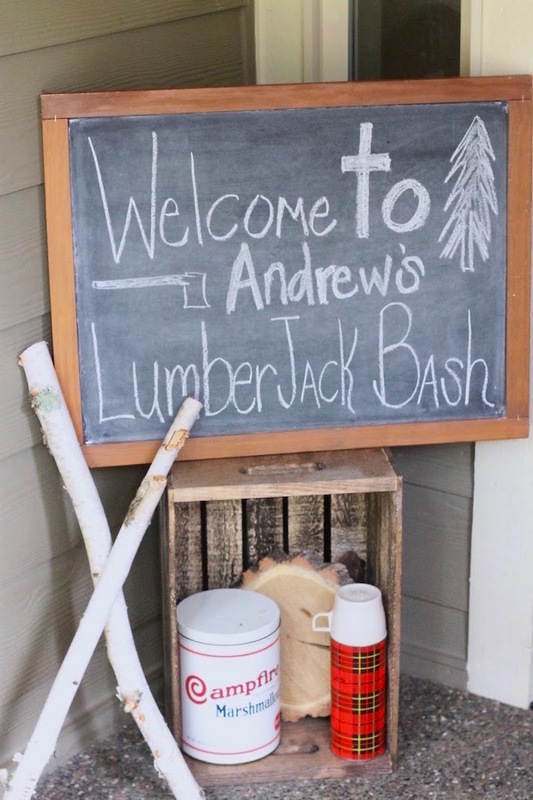 The set comes with everything you could need to set up for your lumberjack bash. 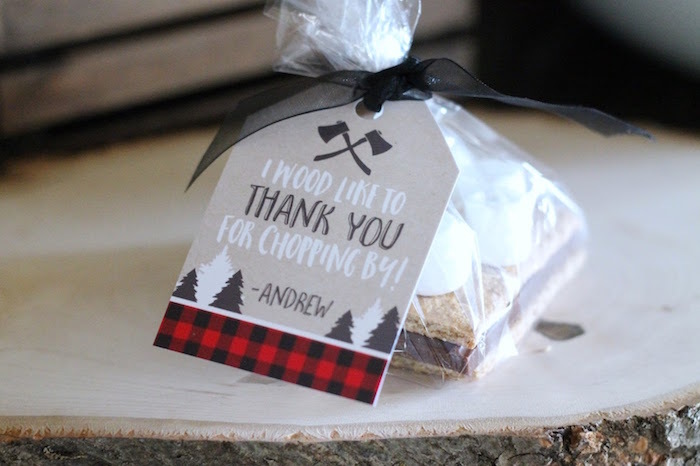 Each guest was given a foam axe and their own little s’mores pack favor to take home.The s’mores packs were really easy to make. 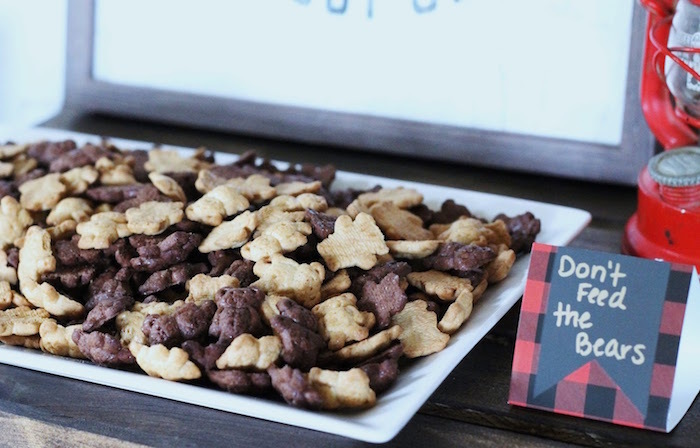 Assemble two graham crackers, mini marshmallows and a piece of chocolate. 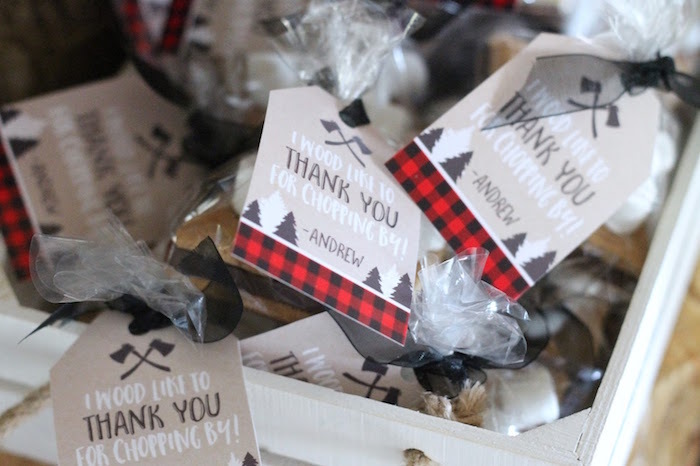 Place in a small cellophane bag, add a tag and tie with ribbon. 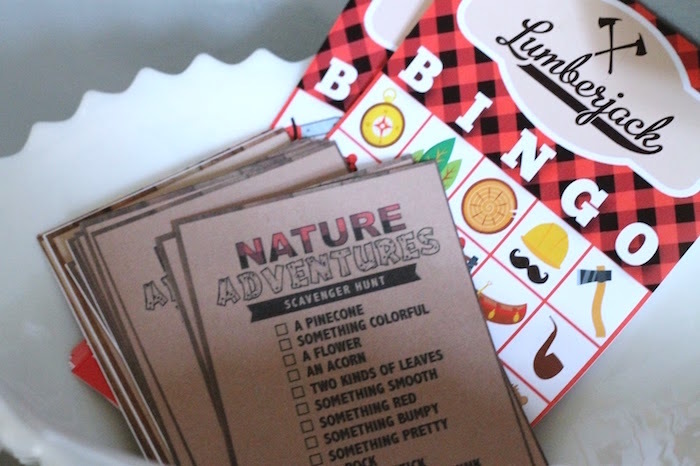 For games we had an “axe throwing” competition and a nature scavenger hunt. 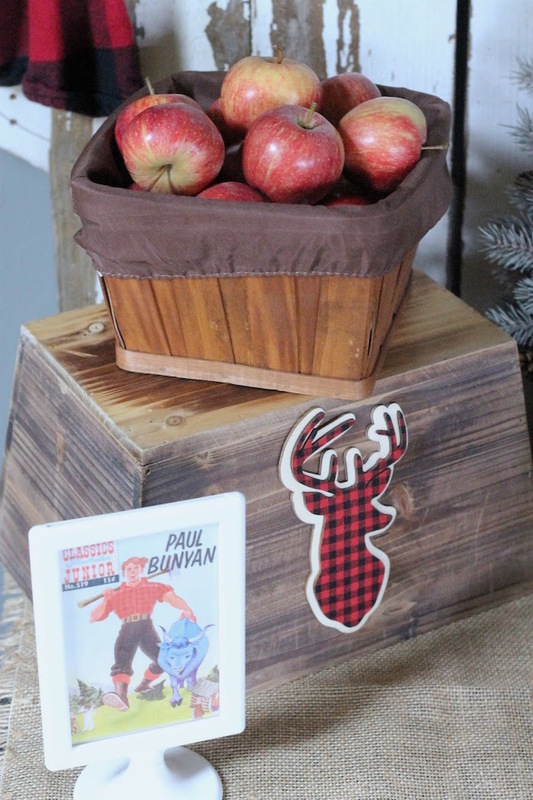 Each kid was given a paper axe to place onto the log, just like pin the tale on the donkey. 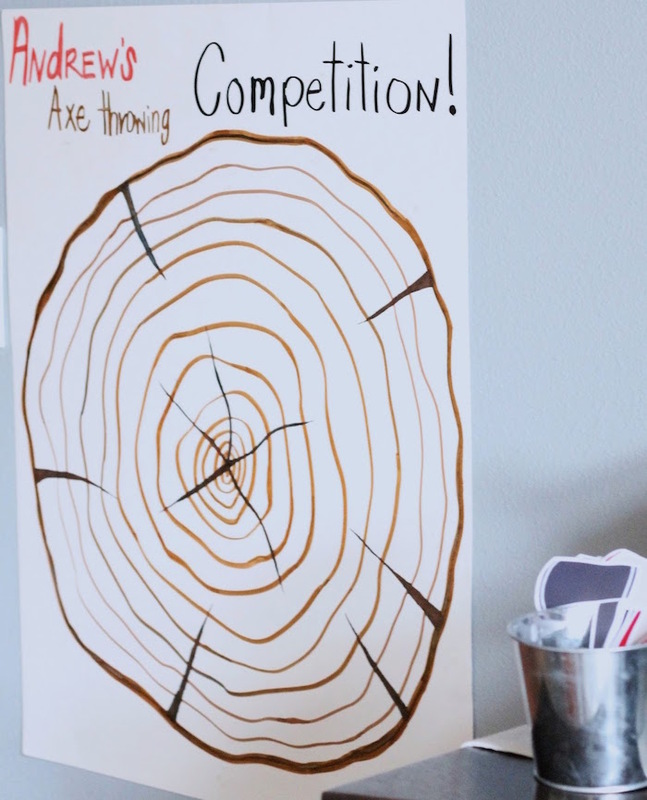 Since I didn’t have the ability to print a large log I used poster board and hand drew the fresh cut log for kids to pin the axe to. 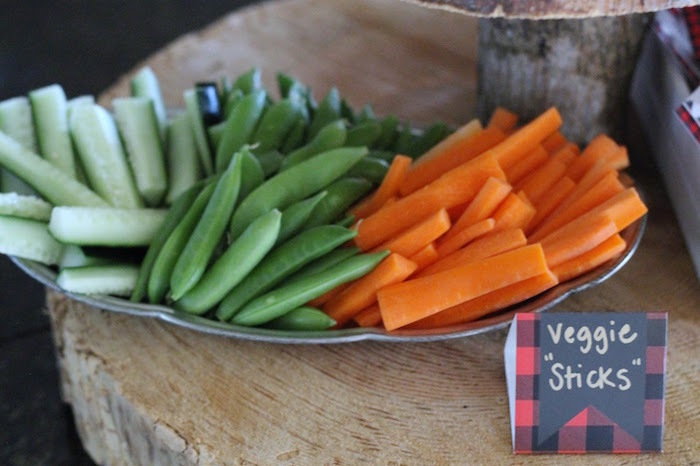 It turned out pretty good and the kids all loved this game. 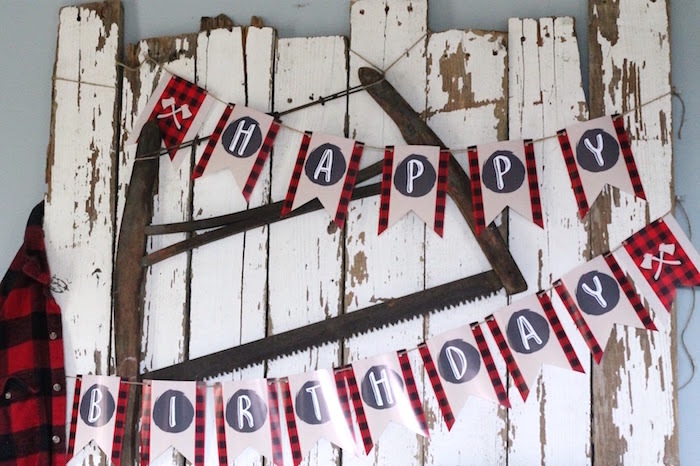 Another successful birthday celebration in the books! This little boy has changed so much over the past year, looking forward to seeing what this next year brings. 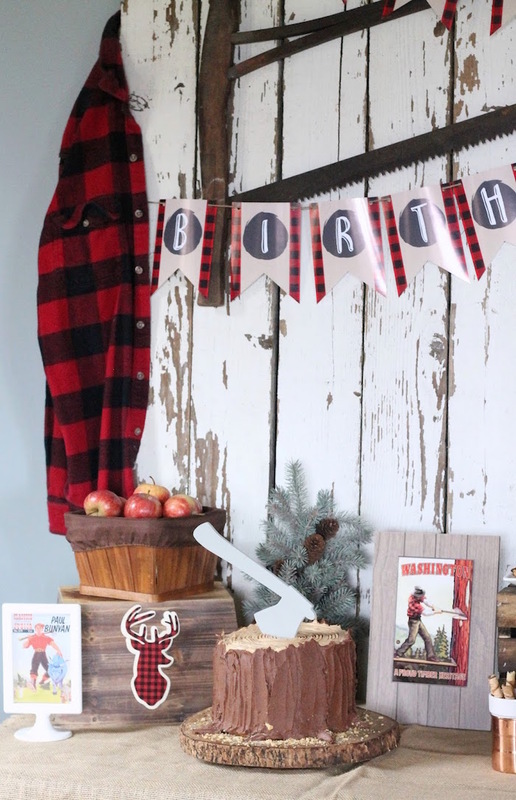 Love this lumberjack party? 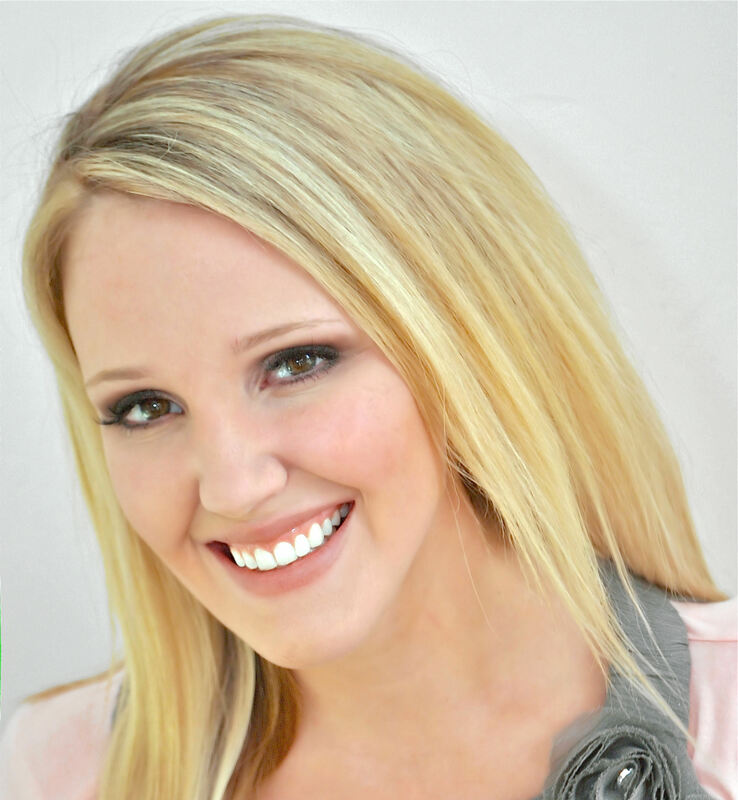 Check this one out too! 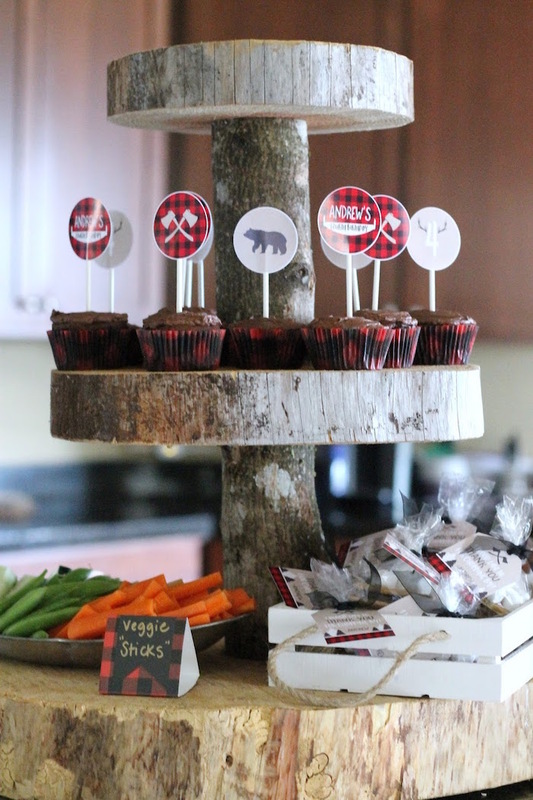 This was such a fun party to create! !